This is a very good player if used as a CD player. It has a crisp, vivid picture of some beauty, but it is now dated by all means as a dvd player, its a no-go. However if used as a cd player, one will be surprised with the superbly balanced, clean, fast, open, airy, and very well separated sound. Bass, middles, and highs are all projected correctly with authority. You will be amazed with how beautifully solid and neutral this old unit sounds. It plays all cdrs imaginable too! Picture quality Easy to use (remote also) 5.1 Decoder for DD & DTS !!! DTS RULEZ !!! Virtual surround. Video quality. Setup is easy. Remote is good. The silver feet look gawdy. If you watch a DVD with no volume then the player is a bit noisy. I have the Pioneer 626 DVD player hooked up to a Yamaha R-V901 receiver which powers 2 Mission 733 tower speakers. Since I don't have rear speakers I have the DVD set to Virtual Surround and it is awesome. I will someday upgrade my receiver and get rear speakers, but in the mean time am satisfied with the virtual. Often I am fooled that I have rear speakers. I am impressed. Comparing the 626 to my Yamaha CD player I would say that the Pioneer has more depth and crispness. The Yamaha is a 5 disc changer so use it when I want to listen to multiple discs, but other than that use the 626 for CDs. I like the joystick on the remote and the keys are easy enough to read. The picture is awesome. Still, fast forward, reverse, and slow all are great. Memory is great. Have not used the video adjustment yet. My daughter is taking French so likes to set the language and subtitles to French. In retrospect I would get this again. Picked it up for 389.00 on the internet. Great price for a great player. in all modes i love dts and 5.1 my jbl speakers and sub woofer are blown away watching movies. Don,t blame the player if you do not like the sound. the remote is great if you take the time to learn it and read the manual.If you are like me and do not feel you need a recording studio to listen to dvd's and cd's or if you do not have a phd in sound or want people to think you do than this player is for you. After 2 bad experiences with the Panasonic (Layer Change) and JVC (Pixellation like crazy) I thought I had found "the one" but the one I purchased was dead on arrival, with no video coming out of any of the outputs. When I returned it to the store the salesman mentioned he had the same problem with his personal Pioneer 525. I see some other people have had this same experience. (My player had a manufacture date of October 1999) If you decide to try your luck, just be sure you have a good return policy. As for me, they offered me a Sony 550 in trade and I took that rather than press my luck with them ordering me another 626. Excellent picture and sound. The movie Matrix proved this player to be possibily the best, image is razor sharp with 5.1 Dolby Digital sound to match. The on board sound processor provides superb sound through my Arcam Xeta 2. The only annoying parts are a slightly noisy disc spinning, but okay when playing movie and not hanging on menu screens. Also the remote control could be more user friendly. But these are minor points when compared to the overall performance of a very, very good DVD player. Built-in DD 5.1 and DTS, plays VCD/CD-R/DR-RW. Inconvenient remote, crappy screen saver, doesn't play newest MPEG4 SVCDs. Also, I would be the happiestman if it was region-free. 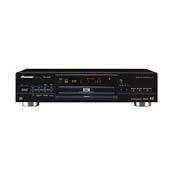 I first bought a Panasonic A-320, used it for a week and returned after I figured it won't play CD-R disks. Got Pioneer 626D as a replacement after a careful research on several sites. Well, Panasonic had an audiophile sound quality but too sharp and granular picture for my eyes. Pioneer's video is smoother, audio sounds a little more "electronic" but it's still Hi-Fi quality. Unless you listen to classical orchestra music all the time, you won't notice the difference. I had no problems at all playing VCDs and CD-Rs but it won't play a new MPEG4 SVCD I had. Well, these are very rare anyway. Probably the biggest weakness is the remote. Buttons location is counter-intuitive and the buttins are small and all the same size. The joystick is good though. Why they decided to make only some buttons backlit? Why the backlit color is red? That beats me. Another joke is the screen saver. It looks like Pioneer guys bought it in a 99 cents store :-) Many people complain about noisy tray; well mine is pretty quiet so far. OK, that's it with the negativity. In general, I'm really happy wih this unit and would recommend it to anyone. In 3 months I had no problems playing DVDs including Matrix and Fight Club. The features are rich and the setup took me the whole 5 minutes. I've done a lot of experimenting and here's my advice: use S-Video cable to connect to your TV (if it supports it) and use Digital coax audio cable to connect to your receiver (again, if supported). It will set you back for another $30 but you will see the difference. The first one I bought was dead out of the box,no picture at all.Overall a very good player that covers all cds.Cdr CVD,foreign cds. Ergonomic Remote w/ backlit buttons and Jog Shuttle. Integrated DD and DTS decoder. Has only one and not two DACs (as in the 717) for audio. This is the best player that has the features that I had been looking for in a player (See Strengths Above), notably the ergonomic remote with backlit buttons and the very important jog shuttle that's designed very well with the joystick control and menu keys around it. In Australia, this player has an all-gold finish, with matching gold remote. Looks very impressive. I had mine modified to play all regions AUTOMATICALLY without having to set the region and with Macrovision Disabled, so it works right out of the box. Sorry... it's very difficult to find any fault with the player. Excellent sound via onboard DD / DTS decoders. Slightly noisy during disc spinning. Nice to see the Pioneer x1x series lip-sync problem fixed. (Reviewed and tested for lip-sync in 'Total DVD' Magaine in November 99(UK). Has played every disc so far (18 region1 and 14 region 2 discs) with no lip-sync issues. Picture and Audio performance is at least on par with the more expensive Sony 725(My Brothers machine) if not better.